Ledell Lee’s first hard-knock moment came even before he was born. His mom, 16 and on her third pregnancy by a man years older than she was, drank and smoked through his pregnancy. Because of her substance abuse, Ledell was born with a fetal alcohol syndrome disorder, a medical condition that left him with brain dysfunction and intellectual disability. Twenty-eight years later in 1993, Ledell Lee was arrested for the murder of Debra Reese. And on Thursday night, just before midnight, the state of Arkansas killed Ledell in a gross miscarriage of justice. From the beginning, Ledell proclaimed his innocence and wrote to everyone he could think of, beseeching lawyers to fight for him. His journey through the legal system consisted of an unbroken chain of drunk, conflicted, and grossly incompetent attorneys. No one who represented Ledell ever looked at the chasm between the state’s theory of guilt and the proof presented at trial. For instance, the crime scene was drenched in blood, but the state witnesses who put Ledell at the scene said he didn’t have any blood on him. None of the limited forensic evidence tested, like fingerprint analysis, at the time matched him. Ledell has been asking for DNA testing for decades. Until last week, when our team joined his defense and began to frantically investigate the case, no defense lawyer had ever hired a psychologist to test Ledell’s intellectual disability. And no court had ever been troubled by the one pertinent claim his former counsel had raised: that a member of the prosecution team was having an affair with the trial judge at the time of Ledell’s trial. As a death penalty lawyer who handles death penalty cases exclusively, I am all too familiar with the story of poor lawyering and court failures. That said, the facts of Ledell’s case stand out and are an indictment of the system that put him to death. Serious questions of guilt, conflicts of interest by defense counsel, a deeply biased judge, and never presented evidence of intellectual disability: Any one of these bases should be enough to pause an execution. It is profoundly disturbing that even taken together, they weren’t enough to move the courts or the governor to spare his life. Gov. Hutchinson bears heavy blame for the wrongful killing of Ledell Lee. Hutchinson arbitrarily set eight dates for execution — originally as four double executions — based on the amount of midazolam, a lethal injection drug, Arkansas had on hand. Worse still, he scheduled them within an incredibly short period, so he could beat the drug’s expiration date of April 30. The practical consequences of this pace are profound. Every institution that touches these capital cases is overtaxed and beleaguered. For example, when we requested (but never received) Ledell’s medical and mental records from the prison, the lawyer for the prison told us the prison staff simply couldn’t respond in time because of the pressures of the fast-tracked multiple executions. The medical records could well have contained previous IQ testing — records that may well may have helped us save his life. State and federal court staff are overwhelmed by the number of important and serious legal filings arriving at a furious pace and are forced to work at a breakneck pace. This pace jeopardizes the kind of careful consideration necessary for any capital case, but especially one with a pending execution date. In the case of these eight executions, the parole board actually had to curtail their internal clemency policies and procedures to try to process so many applications in such a short time. I got involved in the case two weeks before Ledell’s execution after reading that he was about to die without any lawyer ever having investigated the fact that he might have an intellectual disability. I called a friend who is a life history investigator in capital cases, and together we decided that we should see if there was anything we could do to help Ledell. We knew we would be running against strong headwinds: Courts are hostile to any claims close to an execution date, and we were incredibly close. But we thought if there was a small chance we could do something, we had to try. We made contact with Ledell’s Arkansas counsel, who had only been appointed months before, and who readily welcomed our assistance. The life investigator flew down the next day, and we began the process that typically takes years. We struggled to even obtain the full case files, and it was challenging to find and interview critical witnesses who had never been interviewed during the course of Ledell’s trial or years of appeals. The investigator met with Ledell for two long days and learned basic life history information about him that no one had gathered previously. Ledell thanked her for listening to what he had to say. He was grateful to have a team willing to look into his innocence. The more I learned about his case, the more troubled I felt. There were gross, shocking abuses throughout. I discovered that Ledell’s relationship with his lawyers had broken down over his insistence on defending his innocence. His lawyers had requested to withdraw and stopped working on his case. The judge, the same one having an affair with the prosecutor, wrote to the Arkansas Supreme Court and opposed new counsel for Ledell. He did so while personally disparaging him. The same judge then presided over Ledell’s trial. This was not normal, and far outside of the bounds of the kind of impartiality we expect from judges. The history of Ledell’s defense provided a tour of the worst our profession has to offer, including a lawyer who was stumbling and slurring due to alcohol consumption during his representation of Ledell and another who was sanctioned by the bar for their terrible performance in his case. A neuropsychologist finally tested Ledell for the first time the week before his execution. The results showed that Ledell was likely ineligible to be executed: He had significant intellectual deficits and disability. We would need more time, however, to investigate Ledell’s life history for the expert to make a final determination. As the evidence of Ledell’s unfair trial and appeals grew, so did my anxiety. We had no time and an obstacle course of legal doctrinal hurdles to overcome before any court would consider the evidence of intellectual disability or innocence we wanted to bring. I knew I wouldn’t be able to prepare and file all of the things that needed to be filed with this evidence. It was now just a week before his execution was scheduled, and I sent out a call for help. Many answered this call. The more other people learned about the case, the more joined. Knowing about its injustices moved people to action. I asked a colleague in New York at the Innocence Project for the name of an expert who could look at what we suspected were important DNA testing possibilities. She jumped in and joined two lawyers who worked over Easter weekend and around the clock to draft motions for testing the DNA in light of the troubling questions about Ledell’s guilt. My ears rang with the low hum of adrenaline, a substitute for sleep and symptom of the state of high alert that comes from profound fear. Ledell’s brothers and daughter wanted to know: Would we save him? The night before Ledell’s execution I tried to sleep for a few hours. I was worried, but hopeful. 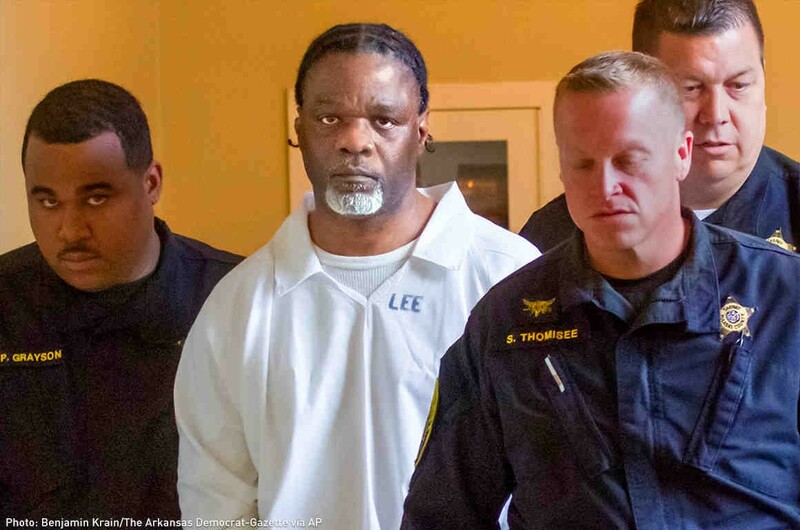 Earlier that day, a trial court in Arkansas put in place a stay of execution after a drug company had successfully won an order barring the use of its drugs in executions because of evidence that Arkansas acquired the drugs under false pretenses. We had filed claims in federal court and in state court, pointing out Ledell’s intellectual disability and the need for a little more time so that we could fully develop and present that evidence and prove that his execution was unconstitutional. We had also filed a motion requesting a few weeks time to allow for DNA testing that was very similar to the motion granted the day before by the state of Arkansas in another capital case set for execution the same night as Ledell. We learned in the afternoon that the stay had been vacated for the wrongly acquired drugs, and then slowly heard one by one that the courts were denying our claims. The state characterized our serious legal challenges as just run of the mill, last-minute filings of a kind that would oppose any execution. Gov. Hutchinson’s scheduling of mass executions had cast a shadow on Ledell’s strong legal claims, where they could be dismissed as nothing more than a delay tactic to get beyond the April 30 drug expiration date. Gov. Hutchinson made it worse by issuing a press statement after the courts granted three stays of execution in the first three cases set, complaining that he had expected one or two cases might get stopped by appeals — but not three. He sent the unmistakable message that he wanted an execution to go forward. I can’t shake the feeling that Ledell’s execution was lost in the fray of the eight scheduled executions and that his claims of innocence, for DNA testing, and of intellectual disability were ignored because of it. The truth is as clear now as it was before Ledell was executed this past Friday. Ledell Lee deserved better. He deserved a through defense and a fair trial. But conflicted and ineffectual lawyers failed him for years. The courts failed him at the end. And Gov. Hutchinson failed us all by setting this unprecedented and wrong execution schedule. Ledell Lee’s execution was shameful. Gov. Hutchinson and the Arkansas courts should avoid compounding the injustice of his unfair execution. The only moral course forward is to abandon the unfair and unjust execution schedule and cancel the two executions scheduled for tonight and the third for Thursday. Carrying out these three executions on this schedule will violate the individualized consideration that the Constitution and justice require and further overstep the bounds of basic human dignity.